Shade: Yes!! The ENTIRE playground is shaded. Safety: Need more safety mulch!! The tire swing is way too high. Cons: This playground is much older than some other playgrounds. The tire swing is obnoxiously high. See the pictures. No bathrooms. Overall Assessment: Love love love that the playground is shaded. Completely shaded! However, the play structure is seriously lacking. Some pretend play is definitely needed to enhance these structures. 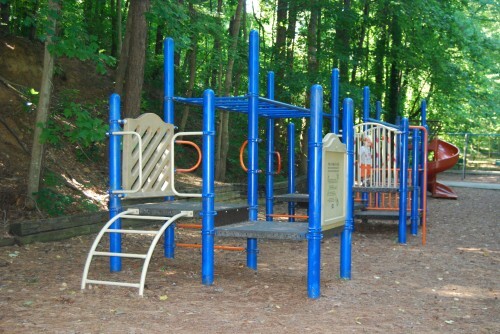 The structures themselves are not very tall, so littler kids are suited for this playground better. Better yet, I think all the big kids would not want to play on it. It’s suitable. It gets the job done. It’s well hidden off the main road. Since Fall of 2012, a new “Friends of Thomson Park” group has been organizing volunteers to help restore and repair the park. With enough volunteers and donors who are interested in the play area, we can extend our work to include that in our future projects. Please contact us at FriendsofThomsonPark@gmail.com. Also, please correct your records, everyone – there is no “p” in Thomson. Thanks! Patrick, I see you are right! I have updated the post. Indeed the sign outside the park reads “W.D. Thomson Park”, not “W.D. Thompson Park” (though it is called “Thompson Park” on Google maps). It raises an interesting philosophical question though: in this internet age, if Google and most of the internet says it is “Thompson”, which is the truth? If you search Google for “WD Thomson Park” it will return results for “WD Thompson Park”, including this and similar sites. You have to force it to perform the requested search to get your site! Anyway, good luck with the restoration! Always good to see park/playground advocates around town!